Historians have long speculated about the importance of dual occupations, especially the mix of mining and farming, which allowed lead mining to continue in hard times and enabled upland areas to support larger populations than they would otherwise have done. This book - a break from our usual monographs, which cover the history and geology of an area's mines - looks at the inhabitants of Heights, near Gunnerside, and their land holdings at a time when lead mining's fortunes were fluctuating. Using field evidence and a range of archival sources, the author has found that, over most of the period, all the houses considered were held by families with some mining connection. The limiting factor in their agricultural activities was not the housing for their cattle, as had been suspected, but the amount of land they had for making hay and the number of cattle gaits they had on the common pasture. 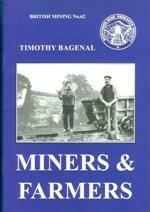 A useful piece of work, BM62 adds to the Society's larger scale study of populations in Yorkshire's lead mining areas.